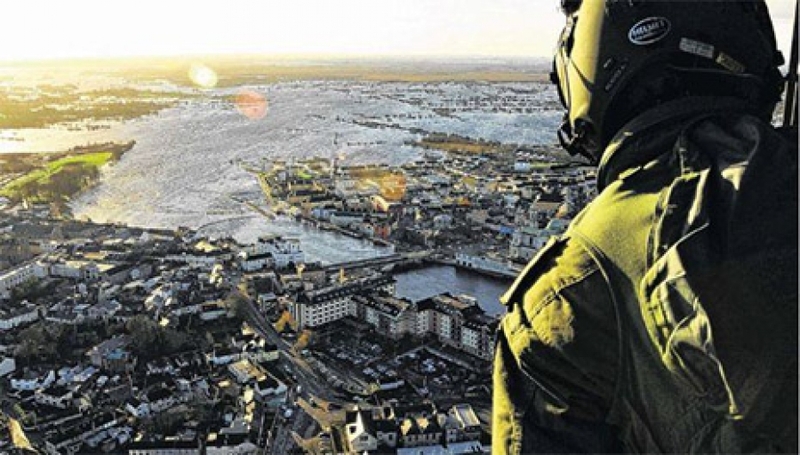 Flooding has become a significant issue across many areas of Ireland. With climate change coming into focus on an international level flood management has never been more important. Flood risk management in Ireland has evolved over time from being primarily focused on the drainage of agricultural land to providing local level flood relief and defence mechanisms and has progressed on to assessing and managing flood risk on a national level. The OPW, as a lead agency for flood risk management in Ireland, is producing Flood Risk Management Plans (FRMP’s) under the CFRAM Programme. The CFRAM Programme commenced in 2011 in line with the National Flood Policy and the requirements of the EU ‘Floods’ Directive. The programme was charged with producing a medium to long term strategy for the reduction and management of flood risk in Ireland. Flood Depth Maps; Data indicates the estimated depth of flooding at a given location, for a flood event of a particular probability. The likelihood of a flood event is expressed in Annual Exceedance Probability percentage (or AEP). So, an event with an AEP of 10% has odds of 10:1 to occur in a given year or a ‘one in a ten year’ event and is considered a high probability. MFRS: Mid-Range Future Scenario - represents a ‘likely’ future scenario, based on the wide range of predictive analysis and with the allowances for increased flow, sea level rise, increased rainfall depths, land movement, urbanisation and forestation within the bounds of widely accepted projections. HEFS: High-End Future Scenario - represents a more extreme potential future scenario, but one that is nonetheless not significantly outside the range of accepted predictive analysis, and with the allowances for increased flow, sea level rise, increased rainfall depths, land movement, urbanisation and forestation at the upper the bounds of widely accepted projections. The National CFRAM programme was preceded by The Preliminary Flood Risk Assesment (PFRA) in 2011. The PFRA was a national high-level screening exercise designed to identify areas in Ireland at a significant risk of flooding. This split the country into numbered Units of Management (UoM) which are then split into a final designation of Areas of Further Assessment (AFAs) which are areas where more detailed assessment is required to develop measures to minimise flood risk. This is where the Local Authorities consumption of this data comes into play in consultation with CFRAM. The OPW has an excellent online map viewer for accessing the flood plans in PDF format for each AFA. However, Local Authorities will often need to disseminate this data across all departments and will need to overlay and combine with their existing datasets in order to maximise the usefulness of this data for day-to-day decision making. The flood extent data is categorised by the AEP percentage, as explained above. Data for each AEP was delivered as a separate shapefile for each Area of Further Assesment (Allenwood, Athy, Castledermot, Monasterevin, Rathangan & Suncroft). The shapefiles for each AFA (10%, 1% and 0.1% AEP) were merged in ArcGIS using the Merge tool and preserving the AFA ID. The ‘coarseness’ of the data was queried by KCC upon presentation however, this data is derived from raster with the optimum spatial resolution set by the OPW and we thought it best not to resample for a smoother appearance as this would compromise the original dataset. It’s generally accepted that this is not data degradation as such, as the input data is accurate. This data was delivered as raster GRID files showing the depth of water during a flood event. Depth data for each AEP (10%, 1% and 0.1% AEP) was delivered as a separate GRID file for each Area of Further Assessment. 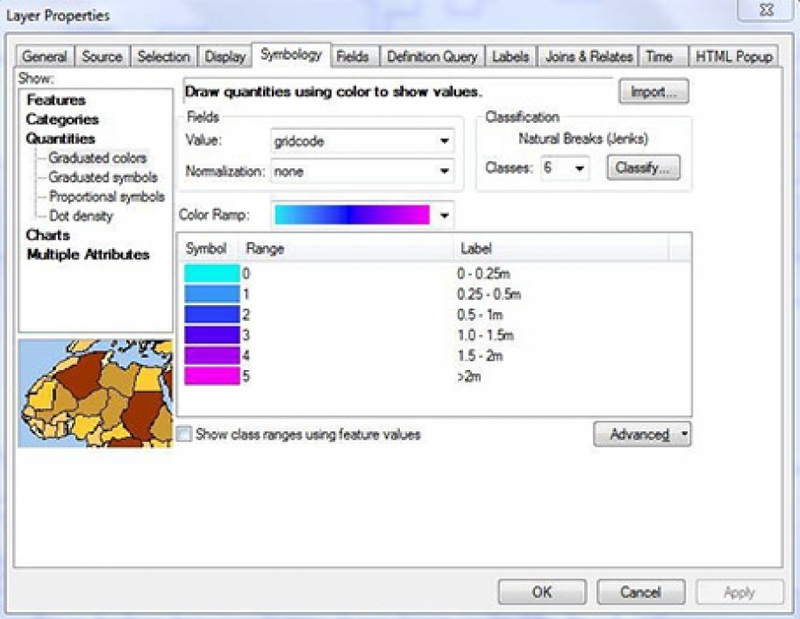 GRID was originally ESRI’s proprietary raster file format and is suitable for representing geographic processes that vary a lot such as hydrological data and flood models. Using the Raster to Polygon tool in ArcGIS (non-simplified) we converted each raster to vector. We then added 2 fields for each shapefile – ‘DEPTH’ and ‘AFA’ to enrich the data with the reclassified ranges, as above, in the field ‘gridcode’. Using the Merge tool again based on AEP value we merged all the Areas of Further Assesment. The Dissolve tool was used to dissolve individual shapefiles based on ‘gridcode’ until we had 3 single shapefiles for Kildare, each one showing the Fluvial Flood Depth for AEP 10%, 1% and 0.1%. The project was relatively straight forward with the imperative on disseminating the data among GIS & non-GIS users with a high degree of accuracy. Most GIS professionals love acronyms – we just can’t help ourselves.